It looks like life might be imitating art. 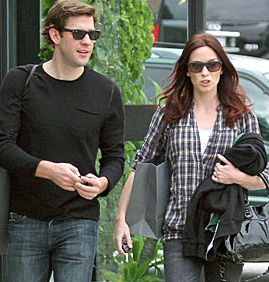 The Office star John Krasinski (whose alter ego, Jim Halpert, will wed Pam Beasley in the sitcom's fourth episode) is set to wed his girlfriend of nearly a year, actress Emily Blunt (The Devil Wears Prada). Emily's spokesperson said: "We can confirm that John and Emily are engaged." Emily, 26, has been previously linked to musician Michael Buble, and John, 29, has dated Renee Zellweger and Rashida Jones. There is no word yet on a wedding date.